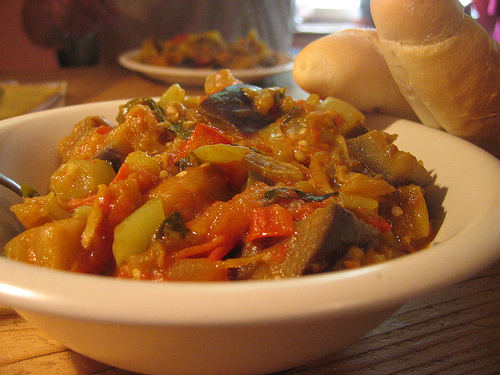 Ratatouille is a traditional French Provençal stewed vegetable dish, originating in Nice. The full name of the dish is ratatouille niçoise. Left: A bowl of ratatouille. 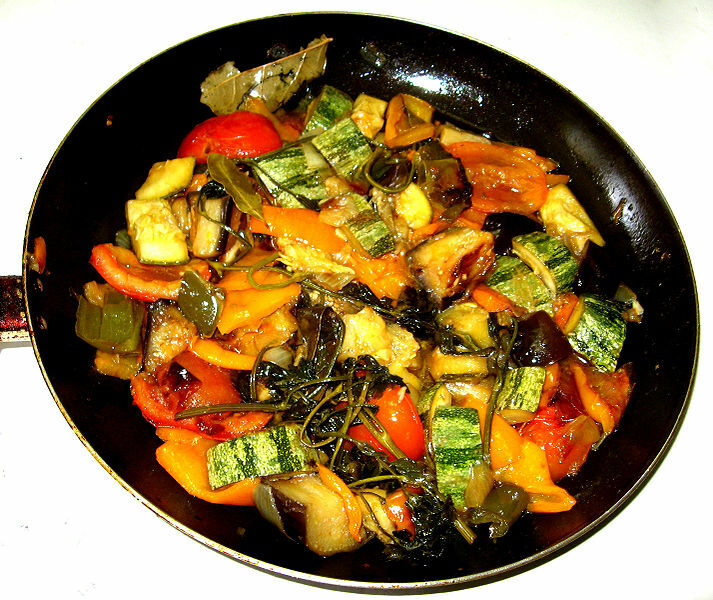 The word ratatouille comes from Occitan ratatolha and the recipe comes from Occitan cuisine. It is also used in French (touiller, also means to toss food). Ratatouille is usually served as a side dish, but also may be served as a meal on its own (accompanied by rice or bread). Tomatoes are a key ingredient, with garlic, onions, courgettes (zucchini), aubergine (eggplant), bell peppers (poivron), carrot, marjoram and basil, or bay leaf and thyme, or a mix of green herbs like herbes de Provence. There is much debate on how to make a traditional ratatouille. One method is to simply saute all of the vegetables together. Some cooks insist on a layering approach, where the aubergine and the courgettes are sauteed separately, while the tomatoes, onion, garlic and bell peppers are made into a sauce. The ratatouille is then layered in a casserole – aubergine, courgettes, tomato/pepper mixture – then baked in an oven.